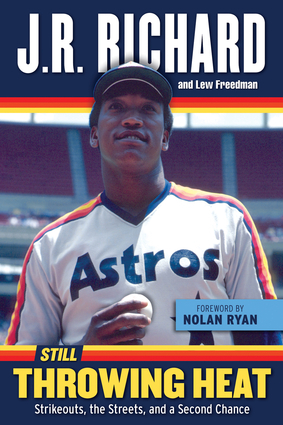 A flame-throwing star with the Houston Astros, J. R. Richard was at the top of his profession when he inexplicably began complaining of arm weakness in 1980. Initially scoffed at because he continued approaching 100 mph on the radar gun, everything changed when Richard collapsed while playing catch with a teammate—later diagnosed as a life-threatening stroke. The shocking development ended Richard's major league career and set off a chain of events that led to the former All-Star being homeless by the mid-1990s. This rapid rise and sudden, tragic fall define the unusual, moving, and inspirational life of a Houston icon who has endured many hardships but has become an admired figure in his adopted hometown. J. R. Richard tells that story now in his own words, including the highs and the lows of his brilliant athletic career, the difficulties that befell him on and off the field, abandonment by those he counted on after his stroke, the despair of losing everything, and his ultimate redemption and giving back to the community. J. R. Richard is a former pitcher who played his entire career with the Houston Astros. After his baseball career was cut short by a stroke, he became involved in his local church in Houston, where he is now a minister. He also spends his time helping to raise funds to support baseball programs for children. He lives in Houston. Lew Freedman is an award-winning sportswriter and the author of 56 books, including illustrated histories of the Bears, Giants, and Steelers. He coauthored Fergie: My Life from the Cubs to Cooperstown and Juan Marichal: My Journey From the Dominican Republic to Cooperstown, with the Hall of Fame pitchers. He lives in Columbus, Indiana. Nolan Ryan is an eight-time all-star who pitched for the Mets, Angels, Astros, and Rangers. He recorded 5,714 strikeouts, the most in Major League Baseball history. He was inducted into the National Baseball Hall of Fame in 1999. He lives in Houston. A flame-throwing star with the Houston Astros, J.R. Richard was at the top of his profession when he inexplicably began complaining of arm weakness in 1980. Initially scoffed at because he continued approaching 100 mph on the radar gun, everything changed when Richard collapsed while conducting a solo workout—later diagnosed with a life-threatening stroke. The shocking development ended Richard's major league career and set off a chain of events that led to the former fastball pitcher being homeless by the mid-1990s. A story that transcends baseball, Still Throwing Heat: Strikeouts, the Streets, and a Second Chance delivers readers a thought-provoking and inspirational story of overcoming adversity. J. R. Richard is a former pitcher who played his entire career with the Houston Astros. After his baseball career was cut short by a stroke, he became involved in his local church in Houston, where he is now a minister. He also spends his time helping to raise funds to support baseball programs for children. He lives in Houston, Texas. Lew Freedman is an award-winning sportswriter and the author of dozens of sports books, including illustrated histories of the Bears, Giants, and Steelers. He coauthored Fergie: My Life from the Cubs to Cooperstown and Juan Marichal: My Journey From the Dominican Republic to Cooperstown, with the Hall of Fame pitchers. He lives in Columbus, Indiana.